The supermarket says it will 'evolve to win' the grocery wars, but its losses are mounting. Sometimes the best defence is a good offence. Facing a rapid customer charge towards convenience stores and outflanked by discounters Aldi and Lidl, the 'Big Four' supermarkets have been battered from all sides. Not one to be cowed into submission, Sainsbury's today fought back, announcing an ambitious, long-term restructuring plan. It'll need it. Like-for-like sales continue to decline, dropping 2.1% to £13.96bn for the 28 weeks to September. And it said it expects supermarket sales to keep falling for the next few years. Underlying pretax profits, meanwhile, slid a further 6.3% to £375m. This figure doesn't include exceptional items, though. Once they're factored in, Sainsbury's actually made a first half loss of £290m. The £633m in exceptional items bleeding Sainsbury's profits is largely made up of value written off from 40 existing stores and 40 mothballed future stores. Like the other Big Four players, Sainsbury's had been building big supermarkets until quite recently, but is now turning towards smaller shops, with capital expenditure slated to be reduced to £500m-£550m a year over the next three years from its current £900m level. Slamming on the brakes costs money. There's little alternative except fairly rapid decline. A quarter of Sainsbury's stores will have under-utilised space in the next five years - so of course it makes sense to focus on the areas of the business that actually make money, even if it's expensive to do so. Chief executive Mike Coupe's strategy is to expand and diversify in profitable places, building 100 new convenience stores this year and next, and continuing to grow its non-food and online businesses. Sainsbury's clothing sector has already doubled in size since 2008-9 to £750m, and from 2015 will be available from its website - watch out Asos. Coupe also focused on the relatively high perception of Sainsbury's quality, manifested in the 4% like-for-like sales growth of its Taste the Difference range. 'We will continue to differentiate ourselves from a position of strength', he said, adding that the strategy would be 'delivered by the most experienced team in retail', a dig perhaps at a certain rival's recent, ahem, turnover in senior staff. 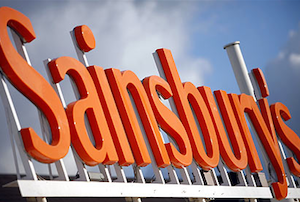 The final prong of Sainsbury's strategy is to 'invest in price', shaving £150m from its bottom line in order to compete with the discounters, while at the same time cutting costs. This follows Sainsbury's own clever pairing with Danish discounter Netto, with whom it will open 15 stores in the UK in 2015. However, taking on the discounters at their own game may prove a Lidl shortsighted. 'The middle classes are on the move, and their destination is Aldi and Lidl,' said John Ibbotson of consultants Retail Vision. '£150m of price cuts is peanuts compared to the amounts Asda, Tesco and Morrisons have put aside.' To put that in perspective, Tesco put over £1bn into price cuts last month. The longer-term strategy of refocusing on quality, convenience and diversification may prove effective. Indeed, Sainsbury's has probably come out better than its major rivals from the recent turbulence. But it's not in the clear yet. The firm said it 'expected profitability to be lower in the second half', following its price investment and heavier cost cutting in the first half. When you consider its first half losses and the fact that it's pegged its dividend to earnings for the next three years, thereby effectively reducing the amount it pays to shareholders, Sainsbury's better hope its investors share its long-term view. Given that its stock fell 4% in mid-morning trading to 258.2p, it looks like they might not be convinced.